Saturday night saw the next instalment of our Alderley Edge eating odyssey, this time accompanied by friends, including a fellow blogger , whose scarily fit and healthy blog is certainly the antithesis of my calorifically focused efforts, but definitely worth checking out! We ate at the Bubble Room, yet another stylish eatery on the high street in the town (and one of a small local ‘chain’ of three venues in the area), which also has a busy and popular bar, where we started the evening with cocktails. The cocktails were excellent, but unfortunately the bar service let them down – we were told our drinks would be brought over to us, but instead of getting on and making them, the barman seemed to proceed to serve numerous other customers beforehand, meaning we had to chase him up a couple of times and ultimately waited about 15 minutes, drinkless, before they finally came over. By this point, our table was ready, and despite explaining the situation (and the fact we’d like to remain in the bar and enjoy our drinks first) to the restaurant staff, they actually put us under pressure to go and take up our table, so the initial part of the evening felt stressful – but happily things got better! The restaurant itself is much quieter than the bar (and properly soundproofed, which can all too often be an issue in bar-restaurant venues) and is a small and intimate affair, with probably no more than about 25-30 covers. When we arrived it was almost empty, but soon filled up, which was perhaps why there was a sense of urgency around our taking our seats – I would imagine the kitchen is also small and perhaps couldn’t cope with everyone ordering at once. 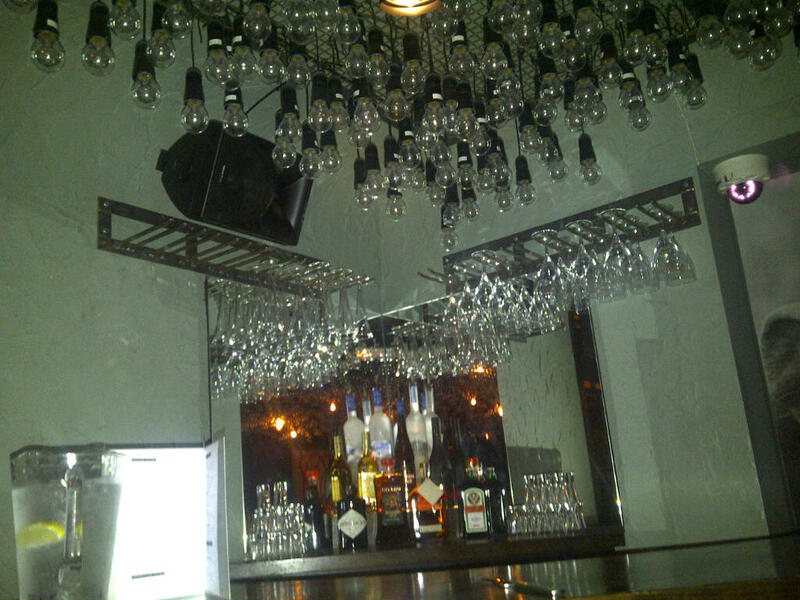 The room can also be hired out for private functions, so has a small bar in the corner. The decor is very unusual, with the ceiling covered in ‘bubbles’ – actually old light bulbs (not lit) and one wall adorned with a picture of (we assume) ‘Bubbles’ – this time the chimp of Michael Jackson fame. It did take us a while to realise the significance of the enormous chimp photograph, but this could have been down to the cocktails rather than anything else. The menu is not extensive but has a good range of options, mostly inspired by traditional British fare (a beef stew was up there on my list of considered options), but with a few innovative takes on some of the dishes, plus a couple of Asian influenced dishes and a selection of Balinese curries. 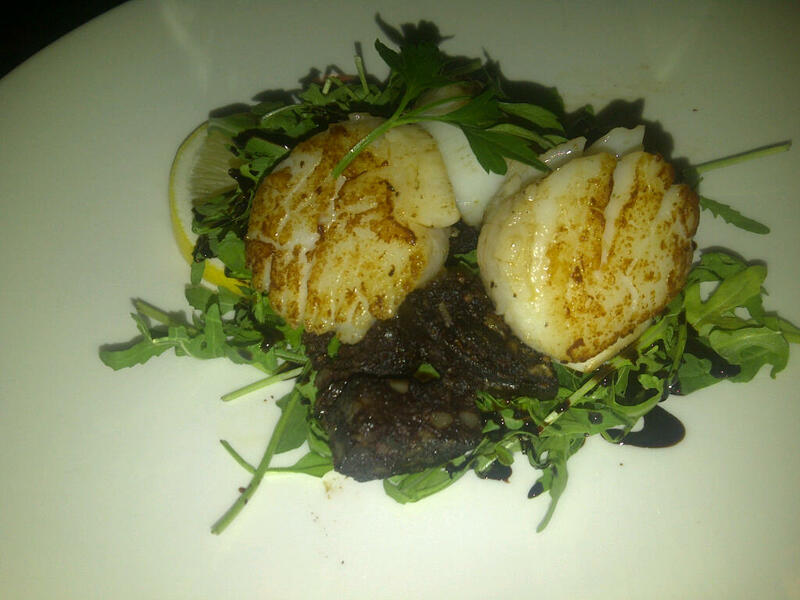 There were also several specials, and to start, Mr W and I opted to share one of these: scallops served with black pudding, rocket and a balsamic dressing. The scallops were excellent: juicy and perfectly cooked, and the black pudding was tasty too. There was nothing particularly unusual about the rocket or the dressing, but it was still a tasty and satisfying dish, and more than enough for us to share. 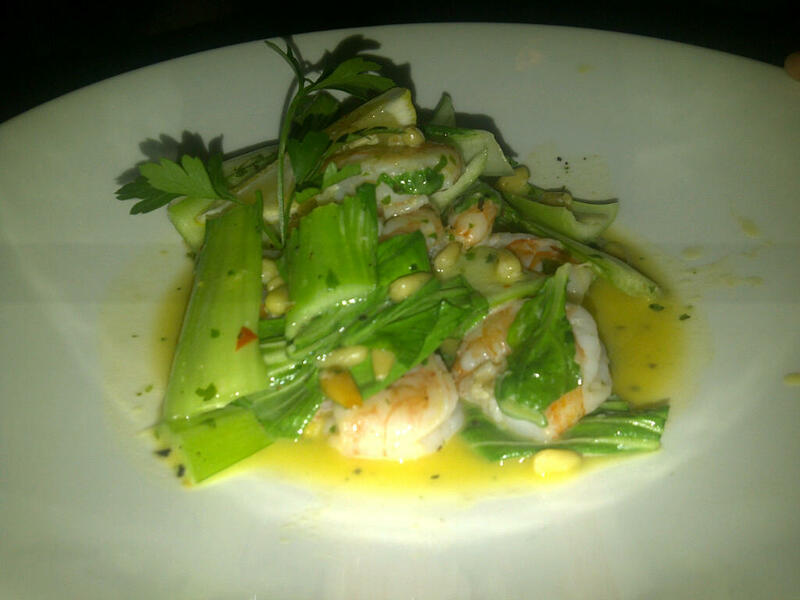 Our friends chose a home smoked chicken breast salad and pan fried king prawns with garlic, chilli and bok choi. Both of these went down very well indeed, and were also extremely generously sized portions. 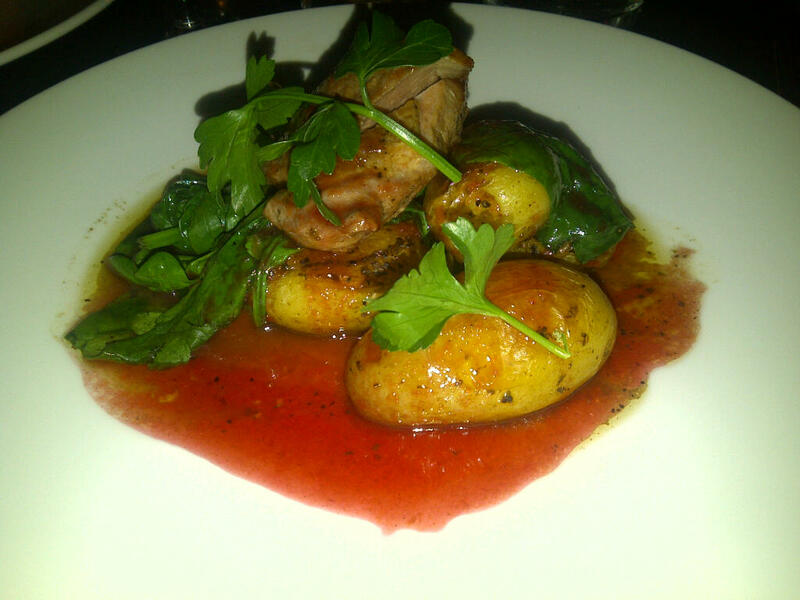 For my main, I had roasted duck breast with rosemary and garlic, served with sautéed spinach, roasted new potatoes and a plum sauce. This was excellent – the duck was served pink, which is always a winner with me, and although I’m not normally a fan of new potatoes, these roasted specimens were excellent, as was the accompanying plum sauce, which was rich and fruity. Mr W chose a sirloin steak, as did one of our friends. These came with the usual accoutrements of thick cut chips (these too seemed to have been fashioned from new potatoes and were almost more like roast potatoes than chips), mushroom and tomato. 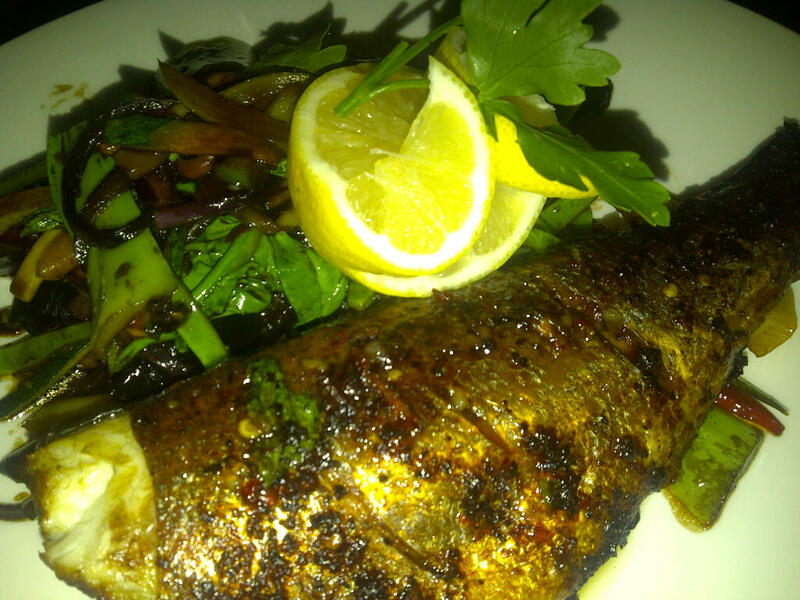 The steaks received praise from both quarters, as did our final main course choice of Thai style whole seabass. All three choices were once again extremely generous portions, the portion sizes meaning that presentation was rustic, bistro style, rather than fine dining style. Pudding time, and I was unable to resist the milk chocolate and Bailey’s cheesecake, which – in an almost unprecedented set of circumstances – actually managed to defeat me, despite Mr W also digging in. 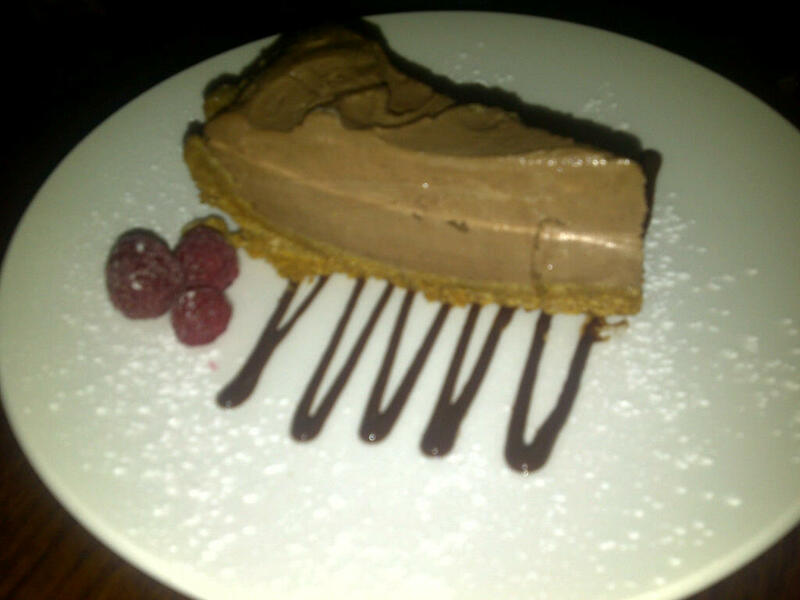 It was a chocolate-lover’s heaven: deliciously smooth, creamy, milky, chocolatey and Bailey’s-y, with a crunchy chocolate biscuit base – but it was an enormous slab, which really and truly could have been half the size and been equally satisfying (particularly after two generous courses beforehand). 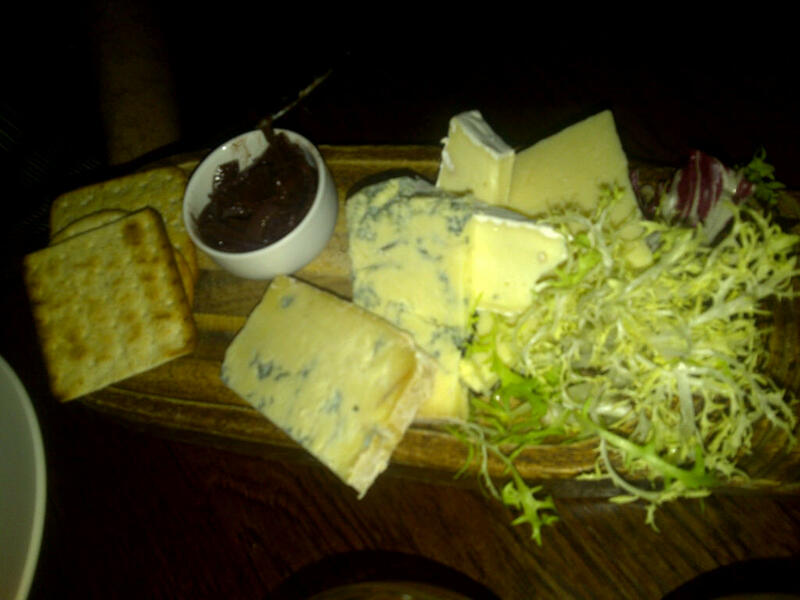 Our friends went for the cheeseboard, which again was easily big enough for two to share, and seemed to have a good biscuit to cheese ratio. We really enjoyed the Bubble Room. The unusual, intimate surroundings make it an excellent Saturday night venue, and the food was hearty and satisfying, but also well-prepared and innovative. The portions were, if anything, a little on the over-generous side, and although I enjoyed everything I had, it was difficult to sample something from each of the three course choices without ending up feeling uncomfortably full up. Three(ish) courses each, plus several nice bottles of red wine came to around £50 per head, but you could easily manage with two courses (and less wine!) to make it a more reasonable evening. The service was efficient, but a little bit unmemorable – and the experience beforehand in the bar, and with then being rushed to take our table (when our tardiness was no fault of our own) was a bit disappointing, hence the lowly two star rating, but on the whole it is somewhere I would like to visit again as I enjoyed the ambience (not to mention the company!) as well as the meal.